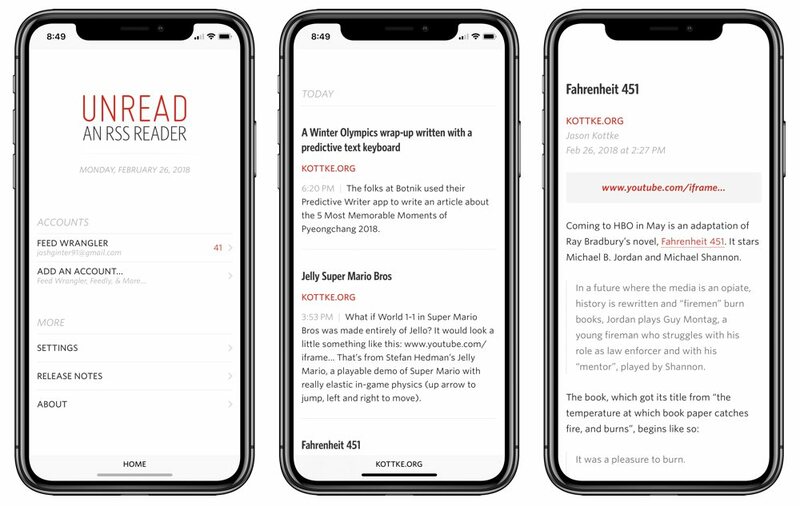 Our pick for the best RSS reader for iPhone and iPad was updated last week, bringing with it new RSS client support, improved iPhone X features, and new Safari Reader options. Unread’s new functionality maintains its support for the latest RSS features, but ensures a pleasant reading experience remains at the forefront of its priorities. Unread has undergone a few ownership changes in the last few years and is now being developed by Golden Hill Software. Golden Hill hasn’t overdone any major changes to Unread’s new iPhone X design (introduced in November 2017), but has reworked some of the app’s interface to be better situated on the iPhone X’s new display. Small changes, like the movement of title bars, have been reworked to better accommodate the iPhone X’s home indicator. That home indicator now also fades in and out when you scroll through an article. Unread has always supported a wide range of RSS clients: Feed Wrangler (my personal choice), Feedbin, Feedly, and Newsblur have all been supported since Unread’s earliest days. With version 1.9, Unread now supports Inoreader and all of Inoreader’s nifty RSS features. Lastly, Unread 1.9 comes with a handy feature capable of jumping straight into Safari’s reader mode. 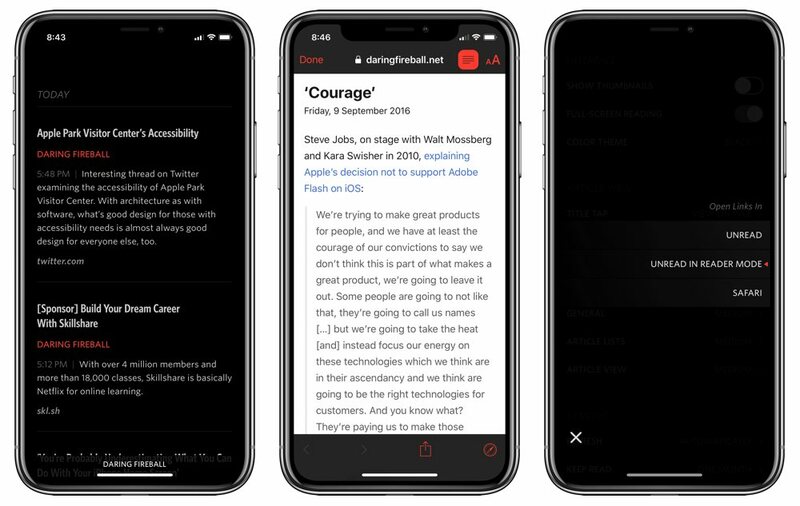 Unread provides an option in its settings to default to the Safari View Controller’s reader mode, providing a reader-first viewing mode for articles inside the browser. For those who prefer to jump to the web, or for those truncated feeds which force you to jump into the web, this option to automatically enter Safari’s reader mode will be greatly appreciated. RSS is on a bit of a rise early in 2018 thanks to a rebirth in tech circles and (likely) due to an exodus away from other social networking platforms. 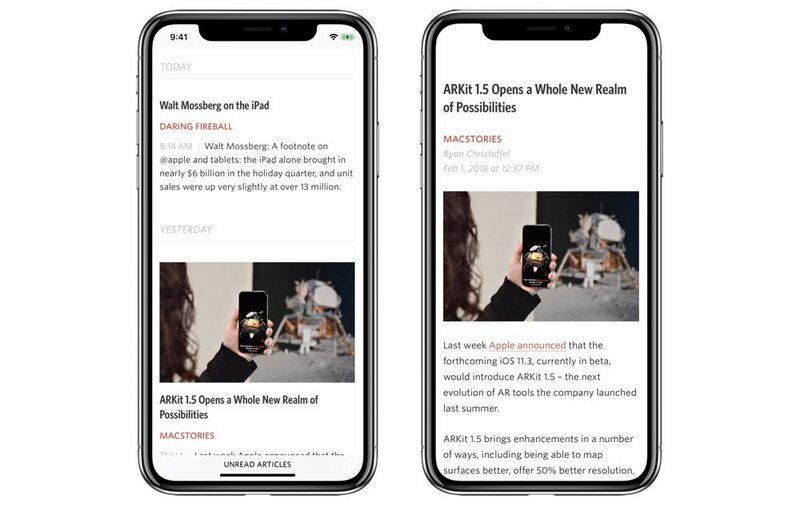 As a result, we’ve seen updates to many RSS apps — like Lire and Fiery Feeds, for example — which have brought support for the latest iPhone and iPad features, as well as the latest RSS clients. Unread still remains our pick for the best RSS reader for iPhone and iPad, but we’ll be revisiting this topic shortly.